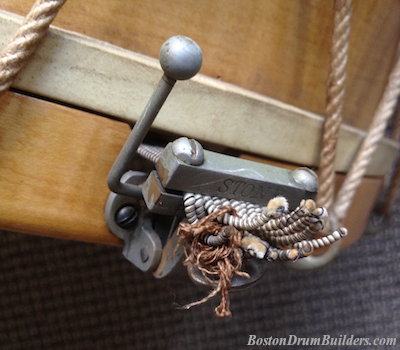 From Watertown, MA comes a nicely preserved rope tension field drum by Charles A. Stromberg & Sons dating from circa 1920. The drum had been passed down through two generations from it's original owner and was safely stored away for many years inside a plastic trash bag in a basement. 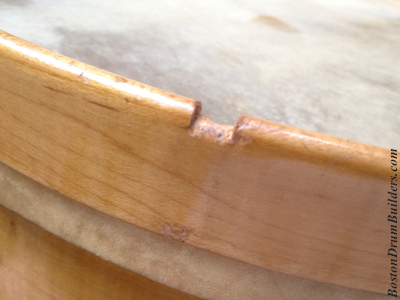 The drum was evidently played back in the day but clearly it was very well cared for. The shellac finish is in terrific shape and lends a wonderful warm hue to the maple shell and hoops. It's a large drum measuring 12" deep by 16" across with the top hoop bearing a very clean Chas. A. Stromberg & Son badge. The shell has a large, highly polished rosewood grommet which is a beautiful aesthetic touch as well as a functional air vent. So often these break and go missing. It is nice to see this one intact. 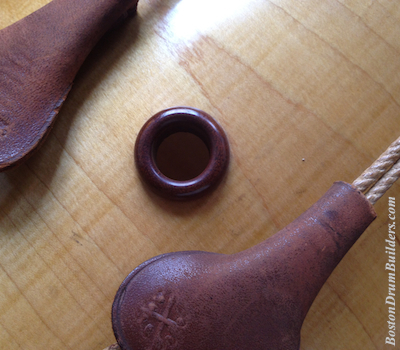 The original rope and leather ears are still and place though several of the ears are dried and cracked making it precarious to tension the drum. They will be left as they are however for the sake of authenticity, and since I do not intend to play the drum this does not present a problem to me. I am more interested in preserving the instrument in as original condition as possible. 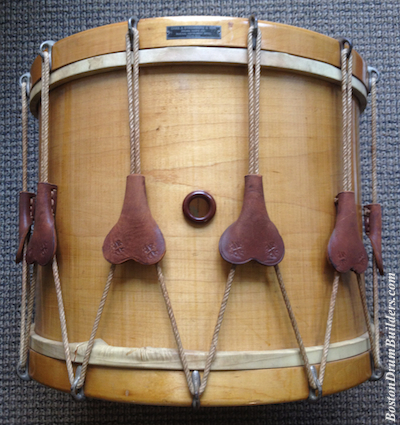 The drum utilizes a factory installed Stone Patent Snare Strainer and Muffler again demonstrating an apparent working relationship between George B. Stone & Son and Stromberg. The drum is set up with calf heads and wire wound silk snares which, if not original, are certainly of the era. The paper label affixed to the inside of the shell is not one I have seen before. 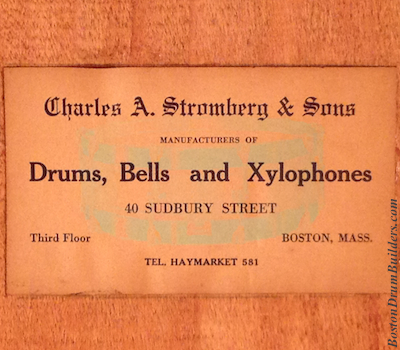 Not only does it read "Charles A. Stromberg & Sons" (plural) but it lists the address of 40 Sudbury Street, Third Floor and a phone number of "Haymarket 581". In the background behind the black lettering is the faint image of a Stromberg Invincible Orchestra Drum, the company's flagship snare drum model at that time. 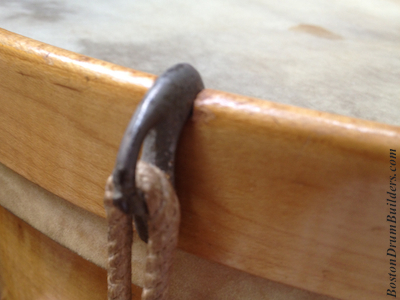 Interestingly, the wood hoops are notched to hold in place the rope hooks. This would assure that the hooks are spaced uniformly around the drum and help provide for even tension and a clean visual appearance. 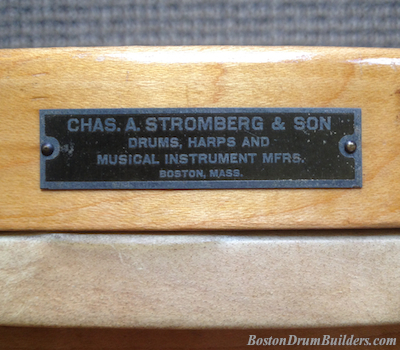 Do you have a drum made by Charles A. Stromberg? I want to hear from you! Send Lee an email at lee@vinson.net.